Just wanted to relay that I had success self programming a $13 key/fob from eBay for my 2016 JK. I purchased the blank from eBay seller remotez4less and my local Ace Hardware cut it for free. You must have 2 working original factory keys to do the self programming. The blank I received was generic, not an official Mopar part for sure. There are a few small differences which didn't matter to me (the eBay one is on the left in these photos). If you want an authentic Jeep key, I've read a few positive reviews for KeyLessJoe.com. That site can cut it as well if you get your "cut code" from the dealer (supposedly free). Insert your second existing factory programmed key and turn to "ON"
Put the new key back in the ignition and try to start the vehicle, if it runs for more than a second then you're good! At first I didn't think the remote start feature worked on the new key, but it was just my timing again. I have to double click on the new key fairly fast. On the factory keys I have to go somewhat slow or it doesn't see the second click. The $13 was a great deal when you consider some folks have reported dealers charging as much at $200 for a new key and programming labor. Last edited by theksmith; 09-21-2018 at 10:06 AM. Thanks for the KeyLessJoe link. I just ordered a fob for my wife's van. This site is like having a personal research department! You must have 2 working original factory keys to do the self programming. Sorry for resurrecting an old post, any idea if this means 2 working keys with remote or just 2 keys? if they are factory keys, then i don't think it would matter if they have a remote or not. the process is just going to be looking at the chip embedded inside the key i think. They must be mopar keys with a chip in them. It's funny because when I did one for my daughter's TJ a few years ago, my ACE didn't want to cut the key because they said they've had issues with Ebay keys screwing up their machine. I took it to the dealer and he cut it for free. In case anyone else stumbles on this old post, I was able to program the key (and remote) with two functional keys, even though only one of the two had the remote. i found out the programming procedure i mentioned in the first post will also work with a regular chip key (i.e. one without the integrated remote). this works better for me since i just needed a key to hide on the rig in case i lose mine while out on a trail. a regular chip key should be waterproof and doesn't need a battery. note that if you lock your rig with the remote, then need to unlock it with a regular key - the alarm will sound. however, as soon as you start the Jeep the alarm stops. 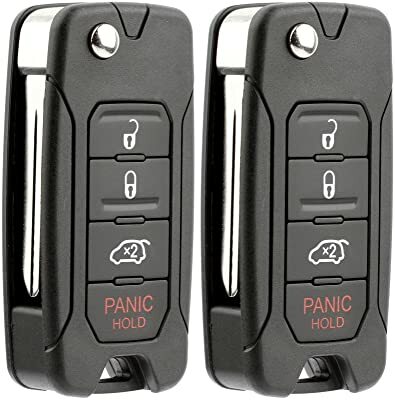 on a related note and filed under "things i didn't know i needed"... you can get a flip-key type fob to replace your factory JK key/remote and stop poking yourself in the thigh! be sure the FCC ID on your remote matches one of the listed ones though, i haven't gotten one of these to test it myself yet. i can tell you not to waste your money on a similar product that uses the internals from your existing remote - i bought one of those kind and it was complete junk. 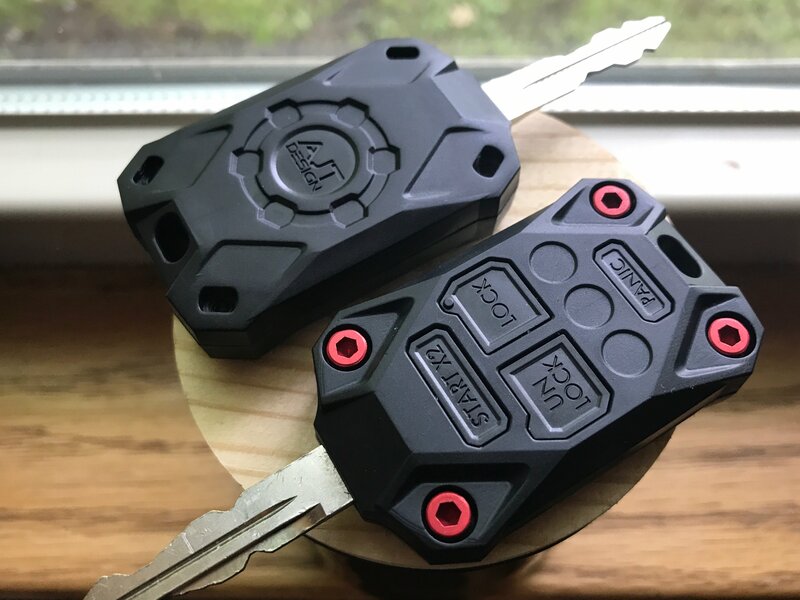 one more key type thing you definitely don't need - unless you feel your factory fob could use a little more techno-manly-beefiness... AJT Design's custom molded key heads. they also have those little Decepticon-keys for all the common Toyota 4x4 rigs! Last edited by theksmith; 09-28-2018 at 11:37 AM.